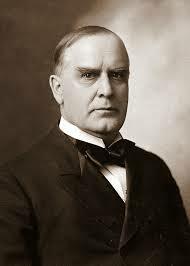 William McKinley’s presidency marks the end of the Gilded Age (graced by such notables as Hayes, Garfield, Harrison and Cleveland) and the beginning of the Progressive Era in American history. McKinley’s presidency also seems to define the word “average” – which I hope does not imply unexciting. The 2010 Sienna College Research Institute survey placed McKinley just one spot better than the most middle-of-the-road president (who in that survey turned out to be George H.W. Bush). I’m beginning my journey through McKinley’s best biographies with the Pulitzer Prize-winning “In the Days of McKinley” by Margaret Leech. Published in 1959, this is one of the earliest comprehensive accounts of the McKinley presidency and is only the fifth female-authored presidential biography I’ve read so far. With 605 pages, this is the longest of my four McKinley biographies; I began reading this book several days ago and have just arrived at the half-way point. So far it’s interesting…but dense. Next I’ll be reading H. Wayne Morgan’s 1963 biography “William McKinley and His America.” This promises to be another comprehensive survey of McKinley and his presidency and is reportedly more a biography and less a history of the era – in contrast to Leech’s earlier biography which, so far, seems to be just the opposite. Then, on to Teddy Roosevelt by early February!